This article is about the Western Super Mario Bros. 2. For the 3DS game with a similar name, see New Super Mario Bros. 2. For the Japanese title also called Super Mario Bros. 2, see Super Mario Bros.: The Lost Levels. Super Mario Bros. 2 (known as Super Mario USA in Japan) is, outside Japan, the second game in the Super Mario series. It is a 2D platforming game originally released for the Nintendo Entertainment System. In the years that followed, it has been ported to many other systems, including a release on the Virtual Console for the Wii, Nintendo 3DS, and Wii U. The game was originally released in North America on October 9, 1988. As a result of Japan already having a Super Mario Bros. 2 (known outside of Japan as Super Mario Bros.: The Lost Levels), the game did not make its debut in the country until after the release of Super Mario World, on July 14, 1992, making it Japan's fifth installment of the series. One of the central game mechanics that differentiates Super Mario Bros. 2 from other Super Mario games is that players can select four characters – Mario, Luigi, Toad, or Princess Toadstool – and each of these characters have their unique gameplay mechanics, offering advantages and disadvantages in their stats. Another distinction is that players cannot defeat enemies by stomping on them: players need to either toss items at enemies or pick up and toss enemies at each other to defeat them. Super Mario Bros. 2 came about after Nintendo of America deemed Super Mario Bros.: The Lost Levels too difficult for Western audiences, which led Nintendo to redevelop the Famicom Disk System game Yume Kōjō: Doki Doki Panic into a Super Mario Bros. game for the international release. After its release, the game became a commercial success, and eventually the game became well received enough that it was also released in Japan. After performing well both critically and commercially, Super Mario Bros. 2 has been re-released as one of the Mario games featured in Super Mario All-Stars, and as well as having its own enhanced port in Super Mario Advance. Many enemies first introduced in Super Mario Bros. 2 have become common recurring enemies in the Mario which includes Bob-Ombs, Pokeys, Shyguys, and more, while the gameplay ability of picking up various items and tossing them has been reused in several later games. "Welcome to Subcon, the land of dreams. Our once-beautiful world now suffers at the hands of the evil Wart. Please help us! Only you can free us from his tyranny. Oh, and remember one thing: Wart hates vegetables." However, before Mario could figure out what was happening, he suddenly awoke on his bed and realized that it was all a dream. The next day, while heading out to a picnic with his friends Luigi, Princess Toadstool, and Toad, Mario told the tale of his strange dream. Hearing this was quite a shock to his friends, who all had the very same dream the night before. Upon arriving at their picnic spot, the group noticed a small cave. Inside was a long staircase that led up to a door. At the top, the four friends opened the door and stood shocked by what they saw. It was Subcon - the world of their dreams! Mario discovers that Subcon has been taken over by Wart and that the events of his dream are true. Mario and co. are now on a quest to defeat Wart and restore peace to the dream world. At the end of the game, Mario, Luigi, Toadstool and Toad are seen being chanted on by the inhabitants of Subcon, who are carrying Wart across the room. Mario then wakes up and wonders about whether the events were true or just a dream. He then continues sleeping and the game ends. When Mario opened a door after climbing a long stair in his dream, another world spread before him and he heard a (faint) voice call for help to be freed from a spell. A screenshot from the Nintendo Entertainment System version of Super Mario Bros. 2. Since the game is based on Yume Kōjō: Doki Doki Panic, it has little in common with the original Super Mario Bros. For example, in order to defeat enemies, the player needs to pluck blades of grass to receive items (such as vegetables), and then throw the vegetables at them. It is also possible to defeat enemies by jumping on them, picking them up and then throwing them to other enemies. There are a few elements in common with its predecessor, however, such as the appearances of the Mushroom and Starman, although the former has a different function. Additionally, there are no power-ups in the game that grant the player additional abilities in the Super form such as the ability to shoot fireballs, making Super Mario Bros. 2 one of the only 2D Super Mario titles (with the other being Super Mario Run) to not have additional forms after the Super form. At the beginning of each level, the player can choose between the playable characters: Mario, Luigi, Toad and Princess Toadstool. All four characters have different powers and statistics. When entering the next level or losing a life, players can select a different character. At the end of most levels of the game, the player fights Birdo. The player has to jump on the eggs that Birdo spits, grab them and throw them back, hitting Birdo three times to gain a crystal which opens the Mask Gate at the end of the level. There are several colors of Birdos: pink, which only spits eggs; red, which spits eggs and fireballs and green, which only spits fireballs. For the green Birdos, there are Mushroom Blocks nearby for the player to use instead. There are seven worlds in this game. The first six has three levels apiece, and the seventh has two. At the end of each world, the player encounters one boss. Mouser is encountered at the end of World 1, Tryclyde in World 2, Mouser again in World 3, Fryguy in World 4, Clawgrip in World 5, Tryclyde again in World 6, and Wart himself at the end of World 7. Defeated enemies and Birdo can re-spawn if the player runs one screen away from the area where they normally appear and return, which may allow the player to defeat the enemies again in order to regain health if necessary. This still occurs in later releases including Super Mario Advance, but a defeated Birdo will not reappear unless the player completely leaves and re-enters the areas where Birdo is fought. Mario has average stats, making him an acceptable choice in all situations. He has no outstanding abilities. Luigi has high jump, but he is weaker than average. He is slightly slower than average as well. Toad is the fastest and the strongest. He has the lowest jump in the game, however. Due to his poor jumping ability, he relies heavily on the charged jump. The princess has a special float jump that allows her to hover in midair, which can be used to jump further or correct an otherwise fatal landing. As a tradeoff, she has the lowest speed and power. The Subcon species are a group of peaceful fairy-like beings that have their land invaded by Wart. Wart traps them in jars, and they plead Mario and his friends for help. They also give Mario and his friends vital information to defeat Wart (Wart hates vegetables). Albatosses fly only horizontally. They can drop Bob-Ombs on players, but they can also be ridden. Unlike other enemies, they cannot be picked up, but they are defeated as with any other enemy. Shyguys often ride Autobombs. Autobombs shoot projectiles, but if the Shyguy is removed, they will simply move. Players can ride on Autobombs, but Autobombs must be destroyed with an item. Beezos fly down and attempt to run into the player. Players can jump on them and pick them up. Bob-Ombs run back and forth and will eventually self-destruct if they are near a player. If they self-destruct, they can harm players. Players can pick them up and throw them. Cobrats are seen roaming on the ground, but they can also hide in jars. If they spot a player, they may jump and shoot a single projectile. Cobrats can be picked up and thrown. Flurries are found only in ice levels. Here, they attempt to run into the player. They move faster than average, but they are prone to slipping. Hoopsters crawl slowly on vines, attempting to harm players. Players can jump on them and even pick them up and throw them. Some Ninjis are stationary enemies that simply jump while others charge and jump into the player. They can be picked up and thrown. Ostros are seen often being ridden by Shyguys. If the Shyguy is removed, they travel in a straight line. They can be picked up and thrown, but they do not bounce off enemies. Pansers shoot fireballs at the player. Red varieties are stationary and shoot three fireballs. Green and gray varieties patrol and shoot up fireballs. Pink varieties chase the player and shoot three fireballs. Phantos are normally dormant enemies, but if players pick up a key, they will attempt to fly into the player. If players drops the key, they deactivate. They cannot be picked up and there are limited methods to destroy them. Pidgits are always seen on carpets. Pidgits attempt to dive bomb into the player, but players can jump on them, pick them up, and throw them. Once the Pidgit has been removed, players can ride the carpet and control it for a brief amount of time. Pokeys attack players by moving slowly into them. Pokeys can be various heights. They can be defeated by having objects thrown at them or their body segments being removed one by one. Porcupos cannot be jumped on, so to defeat them, players must throw an object at them. The basic enemies of the game, Shyguys walk back and forth, harming the player if they run into him or her. They can be picked up and thrown. Red Shyguys walk off cliffs while pink Shyguys turn at the ledges. Small versions of Fryguy that bounce in the player's direction. They appear when Fryguy is defeated. They cannot be picked up or thrown, and must have an item thrown at them to be defeated. Snifits shoot projectiles at players, but they act similar to Shyguys. Gray and green Snifits jump and fire projectiles while the sole red Snifit can walk off ledges. Pink Snifits turn around ledges. Sparks circle around platforms or hover in the air. Sparks can harm players if players touch them. Trouters jump from below and fall back. Players can use them as platforms to jump across gaps, but Trouters can harm players if players touch them at the sides. Tweeters, although they have wings, are found hopping across the ground. They can be picked up and thrown. Not typical enemies, whales serve generally as platforms. Their bodies and their tails can be jumped on. Their waterspouts can also carry players, but the waterspouts can harm players if players touch them at the sides. Birdo is a recurring boss, although it is not a true boss. Birdo comes in three varieties. The pink one shoots simply eggs, which can be picked up and thrown at it. The red one shoots randomly eggs or fireballs (which harms players if they touch them). The green and gray ones, finally, shoot only fireballs; these ones must be defeated with Mushroom Blocks. Mouser is the first true boss players encounter. He attacks by throwing bombs. The bombs sit for a while before they explode, enabling players to pick them up and throw them at Mouser. If the bomb explodes on Mouser, he takes damage. There are three variants of Mouser: one gray with pink ears, one gray with green ears, and one white with red ears. Its white and red variant, which appears in World 5-3, was replaced by Clawgrip when Yume Kōjō: Doki Doki Panic was remade into Super Mario Bros. 2. Tryclyde shoots a series of fireballs that harms the player if the player touches them. Players must throw several Mushroom Blocks at Tryclyde to defeat him. Fryguy shoots fireballs at players. Players must throw Mushroom Blocks at him to damage him. Once he takes enough damage, he bursts into Small Fry Guys. These take one hit from a Mushroom Block to be defeated, and destroying these enemies clears the level. Clawgrip throws rocks at players. These rocks can be picked up and tossed at Clawgrip, inflicting damage on him. Once he is hit five times, he is defeated. Although most Mask Gates are harmless and allow completion to the level, the Mask Gate within the dream factory is aggressive, attacking the players by flying into them. Players must attack it with Mushroom Blocks to stun it for a short period. Once it is stunned, it allows entry into Wart's room. Wart is the final boss of the game. He moves back and forth and shoots harmful bubbles at the player. A machine nearby spawns vegetables. To defeat Wart, players must throw these vegetables at Wart when Wart's mouth is open. Wart takes six hits to defeat. When players collect this item, they receive an extra life. Pink and red variants of Birdo spit out eggs. Players can pick these up and throw them at Birdo to inflict damage on it. Bombs can be found normally, from plucking vegetables, or from Mouser. They eventually explode, destroying breakable blocks as well as harming nearby enemies and players. Found scattered throughout levels, cherries can be collected. If players collect five, a Starman appears. Coins are found only in Sub-space. When players pluck vegetables, they receive coins. Coins are used in the Bonus Chance at the end of a level for extra lives. Found at the end of the level or by defeating Birdo, Crystal Balls enable the Mask Gate to open so players can complete the level. After Pidgits are defeated, players can ride and control the flying carpet for a short time. Jars, as with Warp Pipes, can be entered by having the player duck. Jars contain usually some items, including POWs, Turtle Shells, and keys. Jars also contain some enemies, such as Shyguys. Keys open locked doors, granting access to another part of the level. Phantos guard it, however. Found after being plucked, Magical Potions creates a door depending where the players toss them. This door leads to Sub-space. Found only in certain spots of Sub-space, Mushrooms give an extra vitality point once they are picked up. This vitality remains for the rest of the level. The Mushroom also restores any lost health. Mushroom Blocks are simple throwing items. They can be used as weapons or get stacked so players can reach higher places. Mushroom Block designs vary from world to world. POWs can be thrown to create a powerful quake. This quake defeats most enemies in the screen. Rockets are found in grass. If a rocket is found, it automatically transports players to the next part of the level. For every eight enemies defeated, a small heart will appear. Small hearts restore any HP a player has lost. If the player is in small form, the heart grows the player to Super form. A Starman appears after players collect five cherries. Once players have collected a Starman, they become invincible for a short amount of time, enabling them to defeat most enemies they touch. Found from plucking grass, the Stop Watch stops all enemy movements for a brief time. Turtle Shells are found in grass. Once they are thrown, they slide across the ground, defeating any enemy it touches. Once it hits a wall, it is destroyed. If players attempt to land on the shell, they can ride on it. The basic weapon in the game, vegetables are plucked from grasses and can be thrown at enemies to defeat them. Vegetables bounce after they hit an enemy, which can lead to consecutive hits on enemies. If one vegetable defeats enough enemies, extra lives may be rewarded. Enemies that first appeared in this game are marked with an asterisk. Super Mario Bros. 2 started out as a prototype Mario-style platform game developed by Kensuke Tanabe, a developer for Nintendo. The prototype game emphasized vertically scrolling levels and throwing blocks. It was originally intended to be a two player co-op game, allowing players to toss each other around. However, the technical limitations of the NES system made it difficult to produce a polished game with these elements. It was decided to add more Mario-like elements, such as horizontal levels (although many vertically oriented levels were retained in the final project). Some time later, the Fuji Television Company requested that Nintendo create a video game using Yume Kojo mascots, and Tanabe developed the prototype into Yume Kōjō: Doki Doki Panic, which became one of the best-selling games for the Famicom Disk System. In 1987, Nintendo of America got its first look at the Japanese version of Super Mario Bros. 2. Nintendo of America believed that Super Mario Bros. 2, which was a slightly altered version of the first Super Mario Bros. game with an increased difficulty level, would not be a commercial success in the United States and elsewhere in the world. To deal with this, Nintendo took the finished Yume Kōjō: Doki Doki Panic and reverted the licensing changes to once again feature Mario and his friends as playable characters. The game would later be released in Japan under the name "Super Mario USA" in 1992. Many characters and abilities from Super Mario Bros. 2 later reappeared in the Super Mario series. Princess Peach's occasional ability to hover in midair and pull vegetables from the ground (Super Smash Bros. Melee), for example, originates from this game. Toad's nimbleness (as seen in the Mario Kart series, where he is a light driver with good acceleration, and from his running speed in Mario Sports Mix) could also have been influenced from his uprooting speed first introduced in Super Mario Bros. 2. Shyguys, Snifits, Bob-Ombs, Pokeys, and Birdo were also introduced and would later be incorporated into later Mario games. Some of the enemies (most notably Bob-Ombs and Pokeys) have made countless reappearances as enemies within many of the later Super Mario titles. Wart, the main villain, never reappeared in a Mario game after Super Mario Bros. 2, but he appeared in the Nintendo Comics System, and was mentioned in later games. He also appeared as an ally in The Legend of Zelda: Link's Awakening under his Japanese name, "Mamu". 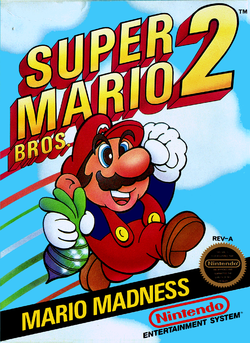 In Japan, the American Super Mario Bros. 2 was eventually re-released under the name Super Mario USA. It was marketed as the American Super Mario Bros. 2, and the game is unaltered save for the title screen. As such, the cast uses the characters' English names (in the manual, their Yume Kōjō: Doki Doki Panic names are also included). Super Mario USA is also the name of the game in the Korean Virtual Console version. The game was ported to the American arcade machine, the Nintendo PlayChoice-10. It was later remastered on the Super Nintendo Entertainment System as a part of Super Mario All-Stars and Super Mario All-Stars + Super Mario World, and it was also included in the Wii re-release of the compilation game, Super Mario All-Stars Limited Edition. The All-Stars version of Super Mario Bros. 2 possessed updated graphics and music. The NES version of the game was released on the Wii Virtual Console for 500 points in 2007. Super Smash Bros. Brawl features masterpieces, short demos of games. One unlockable Masterpiece is Super Mario Bros. 2. Here, the player starts out with the princess immediately (however, it is possible to switch to a different character if the player gets a Game Over before they are forced to quit the game). To unlock it, one must win five brawls with Peach. The game is one of the 30 titles included in the NES Classic Edition and Nintendo Classic Mini: Family Computer. The game was made available for the Nintendo Switch Online service on February 13, 2019. The most notable port of Super Mario Bros. 2 is Super Mario Advance for the Game Boy Advance. This port featured the enhanced graphics and sound effects of the Super Mario All-Stars remaster, as well as voice acting and various other slight changes. It was bundled with an enhanced port of the original Mario Bros. game. Donkey Kong: Clawgrip tosses rocks in a very similar manner to the way Donkey Kong tossed barrels. Also, Clawgrip frequently bangs his chest like a gorilla. In the 16-bit versions, some of the indoor areas look like warehouses with familiar-looking girders in the background. Donkey Kong Jr.: Sparks reappear in Super Mario Bros. 2. This makes them the only returning enemies to appear. Mario Bros.: POW Blocks appear as usable items. Super Mario Bros.: The Starman power-up appears in the game, as well as a remix of the overworld theme from Super Mario Bros. played in Sub-space. Also, the Super Mushroom item, which originated from this game, appears in Super Mario Bros. 2, as well as the ability to shrink once the player is down to one heart point. Also, the ability to run by holding down the button is exclusive to the Mario series, and was not present in Doki Doki Panic. The title theme is a rearrangement of the underwater theme from this game. The Legend of Zelda: The sound effect of Birdo spitting an egg is taken from the sound effect that plays when a magic projectile is fired from Link holding the Fire Rod or from a Wizzrobe. 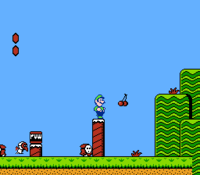 Super Mario Bros.: The Lost Levels: Luigi being a higher jumper than Mario is re-established when he replaced Mama in the game. Super Mario Bros. 3: Bob-ombs return here and act similarly as in Super Mario Bros. 2. Also, Mario can pick up shells or Ice Blocks to throw them. Desert, sky, and snow themes of levels and doors returned. Players can earn lives via the Spade Panel slot minigame. Peach's sprite is also reused here. Super Mario Advance 4: Super Mario Bros. 3: Vegetables (which can also be added to the main game via the Blue Green Switch), sand that can be dug through, Porcupos, Flurries, Hoopsters, and locked doors return in this game's World-e levels. Super Mario World: Pokeys, Ninjis, and Pidgits first reappear here. Wario's Woods: Toad's strength returns in this game, and he picks up, carries, and throws Bombs and his enemies as he did in Super Mario Bros. 2. Some enemies (such as the Spud) also vaguely resemble the vegetables from Super Mario Bros. 2. Birdo also makes her first reappearance in the Mario series through this game. Super Smash Bros. Melee: A Super Mario Bros. 2-themed stage called Mushroom Kingdom II is selectable, and Birdo frequently appears at the sides of the stage, spitting eggs at fighters. This stage also plays Super Mario Bros. 2's Ground Theme, as well as that game's boss music (during Sudden Death matches). Also, parts of Princess Peach's moveset (floating and picking vegetables) come from Super Mario Bros. 2. There are also trophies of Birdo, Pidgit, and the vegetables. Super Mario 64 DS: Luigi's scuttle jump appears to have been influenced by his jumping style from Super Mario Bros. 2. Mario & Luigi: Partners in Time: Pidgits reappear and they attack as they do in Super Mario Bros. 2. Super Princess Peach: The ability to pick up enemies and throw them at each other to defeat them is reused in this game, although it is not the only way Peach can defeat enemies as she can also attack enemies with Perry. Mario Hoops 3-on-3: The final victory theme is a rearrangement of the ending theme of Super Mario Bros. 2. Super Paper Mario: Francis mentioned having a comic called, "Cyborg Wart", which is clearly a reference to Wart. Also, there were Sammer Guys by the names of "Squatting Birdo", "Pidget on Wind's Breath", "Sleeping Turnip", "Upward Leaping Ninji", "Plugged Snifit" and "Guy Who Fry", references to Birdo, Pidgit, Turnip, Ninji, Snifit and Fryguy, respectively. Super Smash Bros. Brawl: Peach retains her moveset from Melee, and there's another trophy of Birdo. Also, Wart and Birdo's names appear in the random name selection. Finally, Super Mario Bros. 2 is available as a Masterpiece to play. The character the trial starts out with is Peach, (but it is possible to play as another character if one gets a Game Over before the trial ends). Snifit and Mouser appear as stickers. Mario & Luigi: Bowser's Inside Story: In this game, Wiggler sometimes attack by pulling out vegetables, which are the same ones that are seen in Super Mario Bros. 2. Also, one of Bowser's brainwashed minions states that he forgot what Bowser's Castle was originally called (before it was turned into "Fawful Theater"), and mistakenly referred to it as "Mouser's Castle". New Super Mario Bros. Wii: The way the characters are able to pick up the items, such as the POW Block, returns. This game also marks the first Super Mario platformer since Super Mario Bros. 2 to feature a playable Toad. Super Mario Galaxy 2: Luigi's Triple Jump may be based on his jumps from Super Mario Bros. 2. Mario vs. Donkey Kong: Mini-Land Mayhem! : Arrangements of the Overworld Theme, Life Lost Theme, Boss Theme, and Boss Victory Theme are heard in World 1. Mario Sports Mix: Toad's throwing animations appear to be influenced from Super Mario Bros. 2, and his high running speed returns. Super Mario 3D Land: Mario and Luigi's chargeable jumps while crouching resemble the Power Squat Jump ability that the playable characters can perform in Super Mario Bros. 2 while crouching. Mario Kart 7: The Shy Guy Bazaar course makes references to the elements from Super Mario Bros. 2 such as the addition of magic carpets and jars in their original color schemes. The namesake Shy Guys also appear to be the dominant audience members throughout the course. New Super Mario Bros. 2: The Cannon levels resemble Sub-space. Paper Mario: Sticker Star: Pokeys based on their appearance in Super Mario Bros. 2 return. Also, the main theme is a jazzy version of the credits theme from this game. Ninjis reappear as enemies. Super Mario 3D World: Princess Peach and Toad are once again playable characters, and everybody has the same abilities as in Super Mario Bros. 2. An arrangement of Super Mario Bros. 2's "character select" music is used for the Lucky House. Donkey Kong Country: Tropical Freeze: The ability to pluck items out of the ground (using Item Handles) and the ability to carry specific enemies were brought over from Super Mario Bros. 2, according to Kensuke Tanabe. Super Smash Bros. for Nintendo 3DS / Wii U: Grass appears as an item in these games. Peach's Vegetable move and floating ability returns. Also, Luigi performs a scuttle in his jump, a technique that originated in this game. The ground theme is present in Super Smash Bros. for Wii U and can be heard on the stages Peach's Castle (64) and Super Mario Maker. Captain Toad: Treasure Tracker: Turnips return, alongside various roof structures that resemble Wart's castle. Super Mario Maker / Super Mario Maker for Nintendo 3DS: The door sprite from Super Mario Bros. 2 is used in the Super Mario Bros. 3 game style in these two games. Paper Mario: Color Splash: Shy Guys are the most common enemy in this game. An arrangement of the overworld theme from Super Mario Bros. 2 is used in the Spinning-Door bonus areas. Jars make an appearance in Château Chanterelle. Wart is mentioned by a yellow Toad. Super Mario Run: Ninjis return in this game, retaining their colors from Super Mario Bros. 2 and look from Super Mario Advance artwork. An arranged version of the underground theme from Super Mario Bros. 2 is featured in the background music for Remix 10. This is also Peach's first playable appearance in a 2D Super Mario platformer since Super Mario Bros. 2, although the player has to rescue her in order to play as her as she is also the usual damsel in distress in this game. As in her playable appearance in Super Mario 3D World, Peach also retains her ability to float from Super Mario Bros. 2 along with the addition of slowly descending in mid-air. Super Mario Odyssey: Mario can carry and throw Turnips, as in Super Mario Bros. 2. Super Smash Bros. Ultimate: Mushroom Kingdom II from Super Smash Bros. Melee returns with updated graphics and various spirits originating Super Mario Bros. 2 also appear. A new arrangement of the overworld theme is also featured. Ostro and Birdo have their names swapped. These errors remain in Super Mario All-Stars, but are fixed in Super Mario Advance. However, all Japanese releases (dubbed Super Mario USA) do not change the names in the credits, instead keeping the Western localizations. Another mistake which was never fixed for the enhanced ports is the color of the vegetable tufts – in Yume Kōjō: Doki Doki Panic, the grass is consistently black, while in Super Mario Bros. 2 they are red but keep the black coloring after being picked up. Enhanced ports maintain the red coloring for the tufts, though they turn green when dug out. Additionally, at least three versions of the North American manual exist. One version provides the full description of Birdo ("Ostro") as "He thinks he is a girl and he spits eggs from his mouth. He'd rather be called "birdetta. "[sic], while another version omits the second sentence. The full "Birdetta" version is more true to the original Japanese version, which explains that Birdo, known as "Catherine" in Japan, would rather be called "Cathy." A third version of the manual is known to exist which properly labels Birdo and Ostro, keeps the full Birdo bio, and shows artwork of the unusual pink Beezo as gray and misnamed. This matches its depiction in the game and the Doki Doki Panic manual. The NES Super Mario Bros. 2 manual reuses enemy sprites and artwork from the Doki Doki Panic manual (with the notable exception of the Pokey artwork, as well as the omission of a grey Shyguy and addition of Tweeter, Flurry, Spark and Clawgrip). Thus, it uses the designs of Albatoss and Phanto from Doki Doki Panic. During the ending celebration sequence in the NES version, there are common mistakes in the number of levels each hero completes. A number of people involved in the game include the composer Koji Kondo, known for composing the main Super Mario Bros. theme. Kensuke Tanabe is the director of the game with Shigeru Miyamoto and Hiroshi Yamauchi as producers. A prototype build was purchased in 2005. There is a different color palette, which includes tans and oranges, which contrasts with the final version's reds and blues. Princess Toadstool is shown to have more hair. Characters needed to use a Magic Lamp to access Sub-space, similar to Doki Doki Panic. This is a major glitch. It requires precise timing; the character must be small and must enter a jar at the same time they are hit by a Phanto. If this is done correctly, the defeat fanfare will play as usual. However, the character will still go through the jar. When they exit, the character will have no health sections left, yet will still be alive. This glitch remains in the All-Stars enhanced port. If the player throws a Mushroom Block offscreen and does not see it land, even to a place where it should safely land, it disappears until the player leaves through a door and comes back. Super Mario Bros. 2 has been received positively, with IGN editor Lucas Thomas praising the graphics, sound and replay value, although he insisted that Western gamers could have gotten into the Japanese version of the game. GameSpot critic Alex Navarro agreed, and commented that the game "...shows that veering from the beaten path of a franchise's standard game design isn't always a bad idea". The game placed 47th in the 100th issue of Nintendo Power's "100 best Nintendo games of all time" in 1997.. It also placed 81st in the 200th Issue of GameInformer's "Top 200 Games of All Times" and placed 18th on IGN's Top 100 NES Games list. As for sales, it's the fourth best-selling NES game, with 10 million copies sold worldwide. Wii Marcel van Duyn, Nintendo Life 8/10 "It's a bit of an oddball to players familiar with other Mario games, sure, but the fact that it's so different from the rest of the series is what makes Super Mario Bros. 2 such an entertaining game. If you want a fun but unusual Mario experience, look no further - this is pretty much the textbook definition of it." Wii Lucas M.Thomas, IGN 8.5/10 "American gamers really do have the skill to play the Japanese Super Mario Bros. 2, but it was a good move by Nintendo anyway to create this less frustrating, more funky game &#Array; the American Mario 2 is still a lot of fun, and it inspired several aspects of future Super Mario titles. At 500 Wii Points, it's a great value for download. The only reason you may not want to pick it up is if, like Super Mario World, you already own it in another form &#Array; this game was re-released with enhanced graphics and a few other bonuses as Super Mario Advance for the launch of the Game Boy Advance back in 2001. As for the "real" Super Mario Bros. 2? Who knows. But the Virtual Console offers Nintendo a great avenue to distribute it here in its original 8-bit form, should the company ever decide we can handle it." Wii Alex Navarro, GameSpot 8/10 "For all its inherent weirdness, SMB2 was, and still is, quite a bit of fun. The level designs are still challenging to navigate, the bosses are still amusing to fight, and the presentation holds up. This is especially true of the music, which is some of the very best of the era. One minute spent in any of the game's subterranean levels is all you need to get that catchy tune stuck in your head for the rest of your natural life. At 500 Wii Points ($5), Super Mario Bros. 2 is a game well worth downloading, both for older audiences who remember playing it back in the day, and younger players interested in a history lesson. Granted, its value is lessened somewhat if you already own the fabulous Super Mario Advance for the GBA, or specifically want to play the Super Mario All-Stars version that came out for the SNES. But, for everyone else, it's a great platformer that shows that veering from the beaten path of a franchise's standard game design isn't always a bad idea." For a complete list of media for this subject, see List of Super Mario Bros. 2 media. For this subject's image gallery, see Gallery:Super Mario Bros. 2. Super Mario Bros. 2 was represented heavily in The Super Mario Bros. Super Show! along with the original Super Mario Bros. Nearly all of the characters (notably excepting Wart) and game play props appeared in the stories, and were in fact often more prominent than the original game's features. The Mario picture that appears in the box art is a flipped and modified version of the picture that appears on the Super Mario Bros. box art. If the player takes the shortest route possible, the only bosses the player needs to fight are Birdo, Tryclyde, Mask Gate and Wart. The South Korean Virtual Console release on Wii is the Japanese version, Super Mario USA, whereas the 3DS uses the English version, Super Mario Bros. 2. ↑ Nintendo. (February 5, 2019). ファミリーコンピュータ Nintendo Switch Online 追加タイトル [2019年2月]. YouTube. Retrieved February 5, 2019. ↑ Nintendo. (February 5, 2019). Nintendo Entertainment System - February Game Updates - Nintendo Switch Online. YouTube. Retrieved February 5, 2019. ↑ McLaughlin, Rus. (September 13, 2010) IGN Presents: The History of Super Mario Bros. IGN. Retrieved August 2, 2017. ↑ 20.0 20.1 Closer look at the Yume Kōjō: Doki Doki Panic manual, provided by the Back of the Cereal Box. ↑ Super Mario Bros. 2 instruction manual, pages 24-25. This page was last edited on April 6, 2019, at 20:41.